For decades, Excel has been the tool of choice used for Budgeting, Forecasting, Consolidation and Financial Reporting. For most businesses however, this limiting option means the inability to align a budget process with business cycles, resulting in a static business plan that is quickly out-of-date and virtually a waste of time and resources. Imagine having the insight into exactly where you are at and exactly where you are going, plus the ability to run unlimited “what-if” scenarios. Welcome to the new paradigm of DynamicSimplicityTM – Integrity. Accuracy. Speed. With Dynac, you deploy only what you need, when you need it, providing a cost effective solution that grows as your company grows. We’ve got you covered from single entity to multi-entity consolidations. 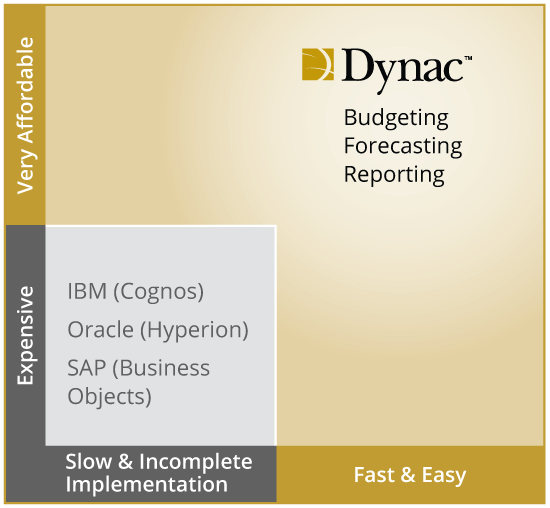 Dynac’s functionality guarantees more advanced, flexible and accurate reporting. In fact, we offer an industry-unique, 100% money back guarantee, so you can have absolute confidence in your choice. As a savvy business person, don’t you agree that it’s time to reach the next level of CFO intelligence with Dynac? Corporate Performance Management (CPM) is a term used to describe software applications that automate Budgeting, Forecasting, Consolidation and Financial Reporting processes – turning rich ERP and CRM data into actionable information. Most organizations start by using basic productivity tools like spreadsheets to manage processes like budgeting, forecasting and reporting. 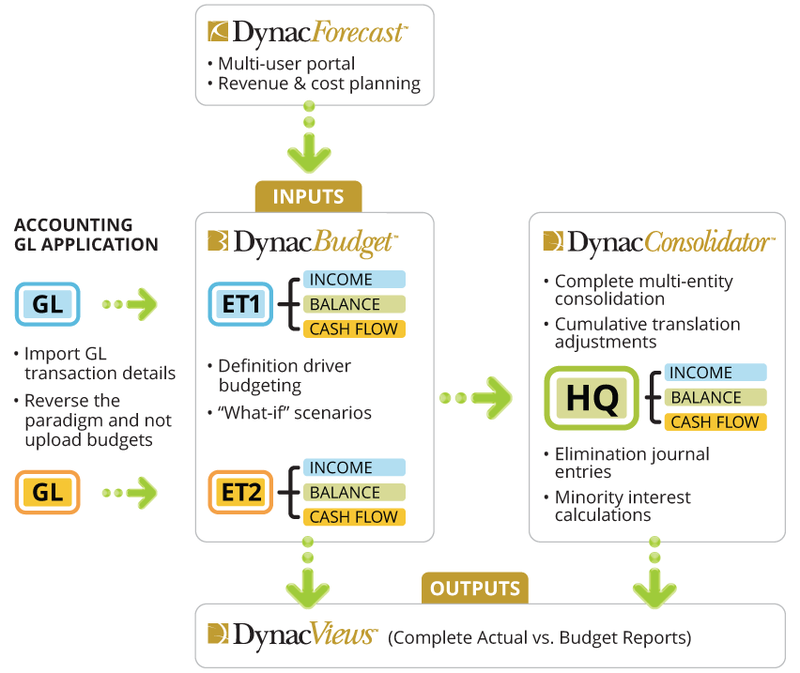 Dynac software, however, combines these processes into a unified solution, providing CFOs and business owners with dynamic visibility into the financial health of their enterprise. Many companies struggle to accurately produce their annual budgets, rolling forecasts, consolidations, and financial reporting processes. Should your company spend less time on data aggregation, manipulation and validation while producing financial statements? Are you a public company under pressure to meet Sarbanes-Oxley/Bill 198 compliance? Does your company struggle to provide credible ‘guidance’? Does your CFO feel uncomfortable signing the financial reporting packaging?